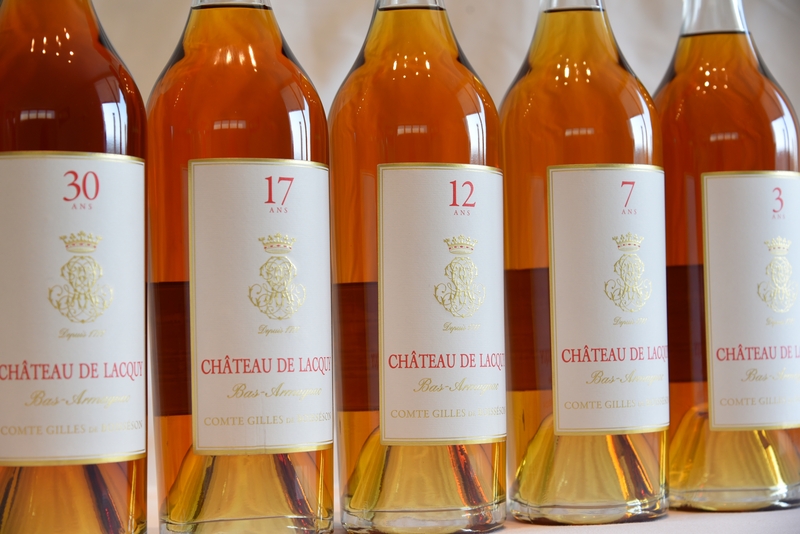 Because Château de Lacquy adds no additives to its Armagnacs, each vintage can vary from one year to the next. We thus decided to create blends of several years to create a range of constant quality. A well-blended Armagnac enables us to ensure consistent taste and continuous quality over time, while expressing all the qualities of the Lacquy terroir. The blends from Château de Lacquy (3-year-old, 7-year old, 12-year old, 17-year old, 30-year old) are made from Armagnacs from 5 different years and from different varietals selected for their specific qualities, (aromas, long finish, colour and others) and blended together in a 4000-litre oak cask. They are stirred and aerated, then put back into 420-liter seasoned barrels for a few months. With the exception of the 30-year which is straight from the barrel, these blends are very gradually and very slightly reduced in the cask by adding les petites eaux (9% max, to go gently down from 48° to 43° for the 3-year and the 7-year) then by aeration. The age on the bottle is the age of the youngest component in the blend.